Every now and then I see a film that stops me in my tracks. A film that has such a profound effect on me that I’m left reeling, still sitting there dumbfounded by the time the credits have rolled. In the world of anime there’s a lot of crap (this often involves ninja lesbian schoolgirls), there are a lot of masterpieces (Akira, Ghost in the Shell), and then there are the ones that are solid yet manage to reel in a more general audience (Hayao Miyazaki’s work for example). Grave of the Fireflies is a film that seems to have made a belated impact in Australia, through dvd sales and the renewed interest in the productions of Studio Ghibli. And all the hullabaloo surrounding this film is deserved. Unwaveringly focussed, profoundly heartbreaking and unforgettable, Grave of the Fireflies is an astounding piece of cinema. Isao Takahata has managed to convey raw emotion and sheer power through the traditionally understated anime style more effectively than the majority of live action films out there. It’s not often you see a war film detailing the plight of the ‘losing side’, and when you do (another example is Wolfgang Petersen’s Das Boot (The Boat)) it’s always an eye opening experience. Takahata’s film focuses on the second world war through the eyes of two caught in the midst of the horror (much as Spielberg’s War of the Worlds does, though I mean no disrespect by comparing the two), as Seita and his little sister struggle to survive the constant firebombing raids. As their country crumbles and their own extended family reject them, their plight becomes more and more hopeless. Grave of the Fireflies had me spellbound, and by the end of it I was questioning the very air I was breathing. The characterisations are sublime – Seita, frequently attempting to hide the worst of the war from his little sister, who in turn is trying her best to remain childlike, despite the horrors around her. It’s impossible to watch this film without shedding a tear, and every shot is framed by unspoken confusion, desperation and rage. At 88 minutes, Takahata’s feature isn’t overlong in the way that Miyazaki’s films are (Howl’s Moving Castle (Hauru no ugoku shiro) being the most recent example). But believe me, those 88 minutes pack more punch than any other film you’ll see for years. 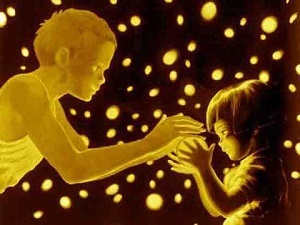 Whilst at times difficult to watch, Grave of the Fireflies is more than a film, it’s a masterpiece of human endeavour, and the hand drawn tragedy echoes every cry of anguish that has sounded throughout the centuries, ever since we first learnt to kill our own kind. This entry was posted in Film Reviews and tagged Animation, Anime, Period Drama, War by Stuart Wilson. Bookmark the permalink.